The next morning, Ryan’s parents arrived to visit for a few days and to help us with the children, as we attended a week long conference. 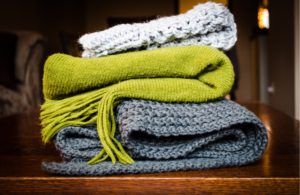 In hand, Grammie Gray arrived with gifts for the kids… not one, but two extra cozy, soft blankets! Blankets she had felt led to buy the day before… God knew Ryan’s heart’s desire, before he even needed to ask. That night, Ryan Jr. had an extra special prayer of thanksgiving!